Drive Lines Ltd is a company that provides components used in the construction of portable workstations, also known as Crusers® at Hayward Tyler, which are patent pending. The Crusers® were named after the late Rob Cruse, who empowered Oliver Buhlinger, a young graduate to invent these solutions. 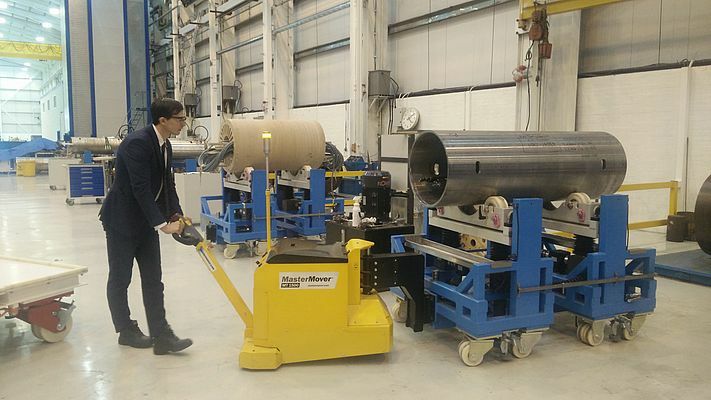 The Crusers® were developed by continuous improvement engineer Oliver with the aim of increasing the mobility of the movement of products weighing up to 40 tonnes to improve work flow efficiency and safety. Drive Lines Ltd was initially a provider of screw jacks. Currently Drive Lines supply Hayward Tyler with couplings, gearboxes, cardan shafts, special combined bearings and profile rails used in the manufacture of the Crusers®. The HT Group (incorporating both the Hayward Tyler and Peter Brotherhood operating businesses) designs, manufactures, tests and services performance-critical electric motors, pumps, turbines and compressors to meet the most demanding of applications for the global energy industry. Much of this performance critical capital equipment operates under extreme conditions including nuclear, offshore and subsea environments. Hayward Tyler has redeveloped its Luton site into a world class manufacturing, testing and assembly Centre of Excellence. To improve efficiency of the manufacturing process, the operations of the overhead cranes were studied. Studies revealed that a safe, more efficient and cheaper alternative to cranes was to transport and manufacture motors and pumps on portable work trolleys. This allows for units to be moved between assembly points with ease along production flowlines. Initial designs incorporated three variations of the trolley, each with on board equipment for specific duties. The components for the Crusers® will be supplied by Drive Lines. Oliver Buhlinger explains: "We were looking to redevelop the production floor of over 8,000sqm, including the addition of a clean assembly and test extension area of over 2,500sqm. Being able to start from a blank canvas, we were able to examine all options. To use overhead cranes and forklift trucks would be the conventional approach for moving heavy loads. However, due to the health & safety risks, crane utilisation and ergonomic challenges, an alternative was sought. The key benefits of the Crusers® include the elimination of fork lift trucks, reducing crane utilisation by 50 per cent to improve safety and significantly reducing manufacturing costs. The reduced crane utilisation resulted in a cost avoidance exceeding half a million pounds." Screw jack systems, bogies and linear guides provided by Drive Lines are used to lift and tilt the stators, and motors whilst situated on the Cruser®. The working platform of the stator can be moved vertically by 350mm, allowing for the working height to be re-positioned. Combined bearings and rails supplied by Drive Lines allow for variable adjustment of the wheelbase ranging from lengths of less than a meter to that in excess of 5 meters. The bogies are powered by cost-effective hydraulic power packs. The power packs can control lifting and lowering of each bogie synchronously or independently to enable tilting of the products for other manufacturing processes. Initially mechanisms behind the adjusting of the work height were to be electrically driven, however hydraulics were used instead to reduce costs and to guarantee protection against dust and water, with an IP rating of IP66. "Drive Lines were very helpful when it came to identifying which components to use, a significant benefit when you are in the conceptual stage. Their expertise and experience helped us identify the appropriate parts to be used" stated Oliver. When a unit is moved from one workstation to another, it is simply hooked up to an electric tug, with which the operator can easily manoeuvre. Crusers® may often be stationary at one workstation for hours, therefore, using detachable tugs, significantly reduces costs for each Cruser®. The Centre of Excellence was formally opened in 2016 and utilises four Multi-Crusers®, eight 'Rotor-Crusers®' and twelve 'Stator-Crusers®'. The figures of the optimal number of Crusers® on the factory floor have been determined through a factory simulation of future predictions of processes and product movements, which has recently won Hayward Tyler the prestigious Witness Horizon Project of the Year award. Hayward Tyler is also marketing the Crusers® as a standalone product range, suitable for a wide range of manufacturing processes within other industries. Having celebrated their 200th Anniversary in 2015, Hayward Tyler is one of the oldest engineering groups operating globally. Much of its global installed base, particularly on the power side is classified as critical, supercritical, ultra-supercritical or ultra-ultra-supercritical. It attributes its success in part to a philosophy of 'customer focus, innovation, and a relentless focus on the continuous improvement of its products, its processes and its people'.